These highlights do not include all the information needed to use PROVENGE ® (sipuleucel-T) safely and effectively. See full prescribing information for PROVENGE. To report SUSPECTED ADVERSE REACTIONS, contact Dendreon Pharmaceuticals LLC at 1-877-336-3736 or FDA at 1-800-FDA-1088 or www.fda.gov/medwatch. If, for any reason, the patient is unable to receive a scheduled infusion of PROVENGE, the patient will need to undergo an additional leukapheresis procedure prior to continuing a course of treatment. Advise patients of this possibility prior to initiating treatment. Do not use PROVENGE until confirmation of product release is received from Dendreon. Dendreon will send the Final Product Disposition Notification form containing the patient identifiers, expiration date and time, and the disposition status (approved for infusion or rejected), to the infusion site. Infusion must begin prior to the expiration date and time indicated on the Final Product Disposition Notification form and Product Label. Do not use expired PROVENGE. Keep the sealed, patient-specific PROVENGE infusion bag within the insulated polyurethane container inside the outer cardboard shipping box until the time of administration. To minimize potential acute infusion reactions, premedicate the patients orally with acetaminophen and an antihistamine, such as diphenhydramine, approximately 30 minutes prior to administration of PROVENGE. Remove the infusion bag from the insulated polyurethane container and inspect the bag for signs of leakage or external damage. Contents of the bag will be clear to opaque, with a white to red color, including shades of off-white, cream, light yellow and orange. Gently mix and resuspend the contents of the bag, inspecting for clumps and clots. Small clumps of cellular material should disperse with gentle manual mixing. Do not administer if the bag leaks during handling, is damaged, or if clumps remain in the bag. Match the patient's identity with the patient identifiers on the Final Product Disposition Notification form and the PROVENGE infusion bag. Infuse the entire volume of the PROVENGE infusion bag intravenously over approximately 60 minutes. Do not use a cell filter. Observe the patient for acute infusion reactions for at least 30 minutes following each infusion. If acute infusion reactions occur, such as chills, fatigue, fever, nausea, and joint ache, interrupt or slow the infusion and administer appropriate medical treatment as needed. In controlled clinical trials, symptoms of acute infusion reactions were treated with acetaminophen, intravenous H1 and/or H2 blockers, and low-dose intravenous meperidine. If the infusion is interrupted, keep the PROVENGE infusion bag at room temperature. Do not resume infusion if the PROVENGE infusion bag has been at room temperature for more than 3 hours. Each dose of PROVENGE contains a minimum of 50 million autologous CD54+ cells activated with PAP-GM-CSF, suspended in 250 mL of Lactated Ringer's Injection, USP. Acute infusion reactions (reported within 1 day of infusion) may occur and include nausea, vomiting, fatigue, fever, rigor or chills, respiratory events (dyspnea, hypoxia, and bronchospasm), syncope, hypotension, hypertension, and tachycardia. In controlled clinical trials, 71.2% of patients in the PROVENGE group developed an acute infusion reaction. The most common events (≥ 20%) were chills, fever, and fatigue. In 95.1% of patients reporting acute infusion reactions, the reactions were mild or moderate. Fevers and chills generally resolved within 2 days (71.9% and 89%, respectively). Thromboembolic events, including deep venous thrombosis and pulmonary embolism, can occur following infusion of PROVENGE. The clinical significance and causal relationship are uncertain. Most patients had multiple risk factors for these events. PROVENGE should be used with caution in patients with risk factors for thromboembolic events. Cerebrovascular disease: In controlled clinical trials, cerebrovascular events (hemorrhagic and ischemic strokes) were observed in 3.5% of patients in the PROVENGE group compared with 2.6% of patients in the control group. In the postmarketing setting, cerebrovascular events, including transient ischemic attacks, have been observed following infusion of Provenge. The clinical significance and causal relationship are uncertain. Most patients had multiple risk factors for these events. Cardiovascular disorders: In controlled clinical trials, myocardial infarctions were observed in 0.8% of patients in the PROVENGE group compared with 0.3% of patients in the control group. In the postmarketing setting, myocardial infarctions have been observed following infusion of Provenge. The clinical significance and causal relationship are uncertain. Most patients had multiple risk factors for these events. PROVENGE is not tested for transmissible infectious diseases. Therefore, patient leukapheresis material and PROVENGE may carry the risk of transmitting infectious diseases to health care professionals handling the product. Accordingly, health care professionals should employ universal precautions when handling leukapheresis material or PROVENGE. Use of either chemotherapy or immunosuppressive agents (such as systemic corticosteroids) given concurrently with the leukapheresis procedure or PROVENGE has not been studied. PROVENGE is designed to stimulate the immune system, and concurrent use of immune-suppressive agents may alter the efficacy and/or safety of PROVENGE. Therefore, evaluate patients carefully to determine whether it is medically appropriate to reduce or discontinue immunosuppressive agents prior to treatment with PROVENGE. The most common adverse reactions reported in clinical trials (≥ 15% of patients receiving PROVENGE) were chills, fatigue, fever, back pain, nausea, joint ache, and headache. The safety evaluation of PROVENGE is based on 601 prostate cancer patients in the PROVENGE group who underwent at least 1 leukapheresis procedure in four randomized, controlled clinical trials. The control group (n = 303) received non-activated autologous peripheral blood mononuclear cells. Patients received 3 infusions of PROVENGE or control every other week over a period of 4 weeks. Almost all (98.3%) patients in the PROVENGE group and 96% in the control group reported an adverse event. In 67.4% of patients in the PROVENGE group, these adverse events were mild or moderate in severity. Severe (Grade 3) and life-threatening (Grade 4) adverse events were reported in 23.6% and 4% of patients in the PROVENGE group compared with 25.1% and 3.3% of patients in the control group. Fatal (Grade 5) adverse events were reported in 3.3% of patients in the PROVENGE group compared with 3.6% of patients in the control group. The most common (≥ 2%) Grade 3-5 adverse events reported in the PROVENGE group were back pain and chills. Serious adverse events were reported in 24% of patients in the PROVENGE group and 25.1% of patients in the control group. Serious adverse events in the PROVENGE group included acute infusion reactions [see Warnings and Precautions (5.1)], cerebrovascular events [see Warnings and Precautions (5.3)], and single case reports of eosinophilia, rhabdomyolysis, myasthenia gravis, myositis, and tumor flare. Table 1 provides the frequency and severity of adverse events reported in ≥ 5% of patients in the PROVENGE group of randomized, controlled trials of men with prostate cancer. The population included 485 patients with metastatic castrate-resistant prostate cancer and 116 patients with non-metastatic androgen-dependent prostate cancer who were scheduled to receive 3 infusions of PROVENGE at approximately 2-week intervals. The population was age 40 to 91 years (median 70 years), and 90.6% of patients were Caucasian. * Control group received non-activated autologous peripheral blood mononuclear cells. The following adverse reactions have been identified during post-approval use of PROVENGE. Because these reactions are reported voluntarily from a population of uncertain size, it is not always possible to reliably estimate their frequency or establish a causal relationship to drug exposure. In a survival analysis of the controlled clinical trials of PROVENGE in metastatic castrate-resistant prostate cancer, 78.3% of randomized patients (382 of 488) were ≥ 65 years of age. The median survival of patients in the PROVENGE group ≥ 65 years of age was 23.4 months (95% confidence interval 22.0, 27.1), compared with 17.3 months in the control group (95% confidence interval: 13.5, 21.5). PROVENGE (sipuleucel-T) is an autologous cellular immunotherapy available as a suspension for intravenous infusion. PROVENGE consists of autologous peripheral blood mononuclear cells, including antigen presenting cells (APCs), that have been activated during a defined culture period with a recombinant human protein, PAP-GM-CSF, consisting of prostatic acid phosphatase (PAP), an antigen expressed in prostate cancer tissue, linked to granulocyte-macrophage colony-stimulating factor (GM-CSF), an immune cell activator. Each dose of PROVENGE contains a minimum of 50 million autologous CD54+ cells activated with PAP-GM-CSF, suspended in 250 mL of Lactated Ringer's Injection, USP. The patient's peripheral blood mononuclear cells are obtained via a standard leukapheresis procedure approximately 3 days prior to the infusion date. Due to the autologous nature of PROVENGE, it is important that the patient and physician adhere to the personalized leukapheresis and infusion schedules. The cellular composition of PROVENGE is dependent on the composition of cells obtained from the patient's leukapheresis. In addition to APCs, the final product contains T cells, B cells, natural killer (NK) cells, and other cells. The number of cells present and the cellular composition of each PROVENGE dose will vary. In-process and final sterility tests are initiated prior to shipping, but the final results are not available for up to 7 days. PROVENGE is released for shipping based on acceptable results from 2-day incubation of the in-process sterility test. The effect of PROVENGE on patients with metastatic castrate-resistant (hormone-refractory) prostate cancer was studied in three similar randomized, double-blind, placebo-controlled, multicenter trials. Following randomization, patients from both treatment groups underwent a series of 3 leukapheresis procedures (at approximately Weeks 0, 2, and 4). Each leukapheresis was followed approximately 3 days later by infusion of PROVENGE or control. The control was autologous peripheral blood mononuclear cells that had not been activated [see Description (11)]. Following disease progression, patients were treated at the physician's discretion with other anti-cancer interventions. Study 1 was a randomized, double-blind, placebo-controlled, multicenter trial in patients with asymptomatic or minimally symptomatic metastatic castrate-resistant (hormone-refractory) prostate cancer. Eligible patients had metastatic disease in the soft tissue and/or bone with current or historical evidence of disease progression concomitant with surgical or medical castration, as evidenced by progression of serum Prostate Specific Antigen (PSA) and/or bone or soft tissue disease. Exclusion criteria included visceral (liver, lung, or brain) metastases, moderate to severe prostate cancer-related pain, and use of narcotics for cancer-related pain. A total of 512 patients were randomized in a 2:1 ratio to receive PROVENGE (n=341) or control (n=171). The median age was 71, and 90% of the patients were Caucasian. Thirty-five percent of patients had undergone radical prostatectomy, 54% had received local radiotherapy, and 82% had received combined androgen blockade. All patients had baseline testosterone levels < 50 ng/mL. Forty-eight percent of patients were receiving bisphosphonates, and 18% had received prior chemotherapy, including docetaxel. Eighty-two percent of patients had an ECOG performance status of 0; 58% had primary Gleason scores of four or more; 44% had bone and soft tissue disease; 48% had bone-only disease; 7% had soft tissue-only disease; and 43% had greater than ten bony metastases. Study 2 was a randomized, double-blind, placebo-controlled, multicenter trial in patients with metastatic castrate-resistant prostate cancer and no cancer-related pain. The primary endpoint was time to disease progression; analysis of the primary endpoint did not reach statistical significance. All patients were to be followed for survival; however, the survival analysis was not pre-specified. 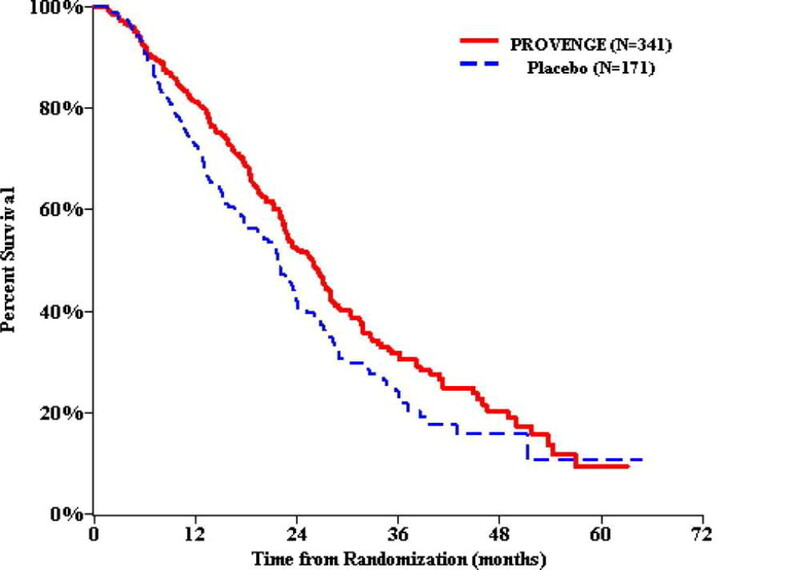 Figure 1 and Table 2 present overall survival results observed in two randomized, Phase 3 studies of PROVENGE in men with metastatic castrate-resistant prostate cancer. The survival findings were consistent across multiple subgroups. Analyses of time to disease progression did not meet statistical significance in any Phase 3 study of PROVENGE. PROVENGE is a 250 mL suspension containing a minimum of 50 million autologous CD54+ cells activated with PAP-GM-CSF in Lactated Ringer's Injection, USP. It is supplied in a sealed infusion bag, labeled for the specific recipient. NDC 30237-8900-6: One bag individually packed in a carton. PROVENGE is shipped directly to the infusing provider in a cardboard shipping box with a special insulated polyurethane container inside. The insulated container and gel packs within the container are designed to maintain the appropriate transportation and storage temperature of PROVENGE until infusion. Upon receipt, open the outer cardboard shipping box to verify the product and patient-specific labels located on the top of the insulated container. Do not remove the insulated container from the shipping box, or open the lid of the insulated container, until the patient is ready for infusion. Report signs and symptoms of acute infusion reactions such as fever, chills, fatigue, breathing problems, dizziness, high blood pressure, low blood pressure, lightheadedness, nausea, vomiting, headache, or muscle aches. Report any symptoms suggestive of cardiac ischemia. Report any symptoms suggestive of cerebral ischemia. Report any symptoms suggestive of deep vein thrombosis. Report any symptoms suggestive of pulmonary embolism. For more information, please call the toll-free number: 1-877-336-3736. Since PROVENGE is made from your own immune cells, your cells will be collected approximately 3 days before each scheduled infusion of PROVENGE. You will need to go to a cell collection center for this collection. The collection is called “leukapheresis” (pronounced loo-kuh-fuh-REE-sis). Your collected cells are sent to a manufacturing center where they are mixed with a protein to make them ready for your infusion. PROVENGE infusion can cause serious reactions. you develop numbness or weakness on one side of the body, decreased vision in one eye or difficulty speaking. Any of these may be signs of a stroke. you get a fever over 100ºF, or redness or pain at the infusion or collection sites. Any of these may be signs of infection. If you would like more information about PROVENGE, talk with your doctor. You can also call toll-free 1-877-336-3736 or visit www.PROVENGE.com.